September’s Book of the Month is an historical novel which was actually first published in 1949 – 60 years ago! Yet, it is one of the best historical novels that I have ever read. Click on the cover shots for purchasing details from Amazon US and UK. 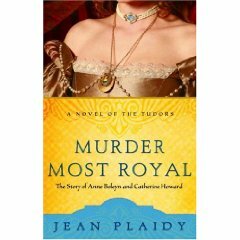 Jean Plaidy’s “Murder Most Royal” may be 60 years old but it beats many of today’s new releases in my opinion and is a must read for Anne Boleyn fans who want to enjoy a fictional account of their heroine without feeling that their heroine is torn apart or slandered. Plaidy paints a sympathetic picture of Anne and she also gave me an understanding of how Henry’s love may have turned to such hatred or indifference, something I have always struggled to understand. Doesn’t that sound like the Anne Boleyn we all know and love? The Anne Boleyn we imagine as we read Eric Ives’ biography? A reckless, strong-willed, quick tempered woman who just had something about her that drew people to her – yes, that’s Anne. In the first part of her novel, Plaidy takes the story from Anne’s childhood at Hever, through her time in France (not the Hapsburg Court as we now know) and her sister Mary’s affair with Henry VIII, to Anne’s first meeting with the King in the rose garden at Hever. I love this scene in the book because Anne pretends not to recognise the King for who he is and Henry is bemused and intrigued by this girl’s wit and “the airs she gives herself”. You can almost feel the sexual frisson here – wonderful! The novel goes on to tell Anne’s story – her love for Henry Percy, her hatred for Wolsey when he stops their relationship, Henry’s passion for her, Henry’s “Great Matter”, Henry and Anne’s marriage and Anne’s subsequent fall. But this isn’t the only story, Catherine Howard’s story is also part of the mix and works wonderfully together, side by side with her cousin Anne’s story. The reader can understand how Henry was drawn to Anne because he had to chase her and now the thrill of the chase has gone. There is no longer any excitement and Henry realises that Anne, having reached that goal after such a long fight, is seeing him from a less than flattering angle too. We all know how the story ends but Plaidy does a wonderful job at explaining it from the different perspectives of the characters involved. But, “Murder Most Royal” does not end with Anne Boleyn’s execution. Plaidy then continues with the story of Catherine Howard, who is “corrupted” at the Dowager Duchess of Norfolk’s house, and goes on to catch the eye of the King. Again, we know Catherine’s story but have we ever seen it through her eyes? Here is a girl who is forced by her elders to brush her past under the carpet and pretend to be a person she just isn’t, a girl who just wants to be with the man she loves, and he isn’t the King! Plaidy leaves the best for last. In the last few pages, Henry VIII is feeling sorry for himself after Catherine’s betrayal and starts thinking about the past. Ghosts are haunting him and he can’t help but think of those he has killed, including Anne. As he looks on his daughter, Elizabeth, he thinks of Anne and I won’t spoil it by quoting it but I really do hope that Henry had these thoughts. I hope that he was, after all, human. “Murder Most Royal” is an enthralling read which captures the reader from the very start. It is incredibly accurate considering that it was written 60 years ago and so didn’t have Eric Ives, David Starkey and the like to keep it on the straight and narrow! 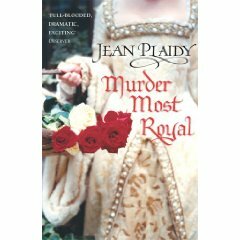 “Murder Most Royal” by Jean Plaidy is available in paperback from Amazon US, Amazon UK/Europe or from any good bookshop. It won’t disappoint you.